REPORTING PRE-LETHAL BEE LOSSES: The real-world of our honey bees needs to have real-world testing. In the May 2015 issue of this magazine, as part of the Honey Bee Health Coalition, an article detailed the process of reporting an acute bee kill. However, not all bee kills are acute evidenced by a large pile of dead bees scattered in front of the hive. Honey bees will die away from the hive if stricken by illness or the effects of pesticides. Their very nature guides them to protect the colony, and die away from the hive if ill or suffering from toxins. The question that arises, though, is how to report bee losses that are not Winter losses, and are not acute bee kills? How do beekeepers report an unusual dwindling of the hive? These are not acute kills, but bee losses caused by sub-lethal, or pre-lethal exposures to toxins in the honey bees’ forage area. A honey bee’s boundary is its flight range, from one to six miles, as it searches for pollen and nectar. Honey bees do not restrict themselves to just the crop right in front of them, nor to property lines or fence lines. Neighboring crops, wildflowers in bloom along field edges, generally any blooming thing in forage range is sampled by honey bees. An adult forager bee may not be affected acutely by toxins in and on the pollen and nectar, however, the brood in the hive may be affected. When the life cycle of the hive organism is disrupted through the feeding of tainted pollen and nectar to brood and house bees, a sub-lethal situation is created starting a downturn in the health and sustainability of the honey bee colony. Nurse bees feed brood what they are supplied. When it is toxic, brood dies. Until incoming resources “clean-up” the hive it will shrink. Even after incoming contamination ceases, and the hive appears to recover, it will suffer later due to eating contaminated stores. 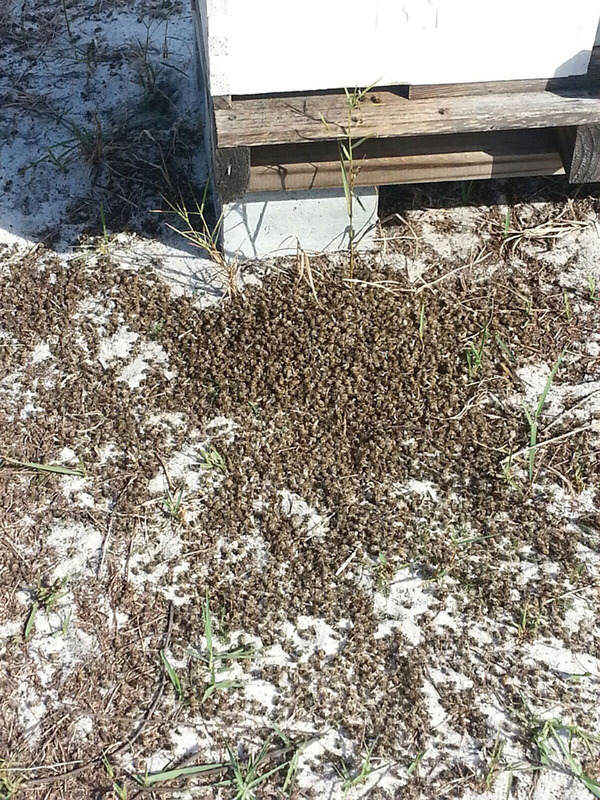 An acute bee kill in Florida. Bee losses while pollinating watermelon. Neighboring field is a cotton crop. Beekeepers sometimes suffer losses while pollinating a crop. One beekeeper stated he experiences 10-25% losses of adult forager bees weekly from pesticide exposure in agriculture from July 1st to August 30th. Not all farming areas feature a single crop, but a variety of crops adjacent to each other. Many of these crops may be treated with pesticides in a constant and ongoing manner, such that the bees do not get any relief from the mix of pesticides. 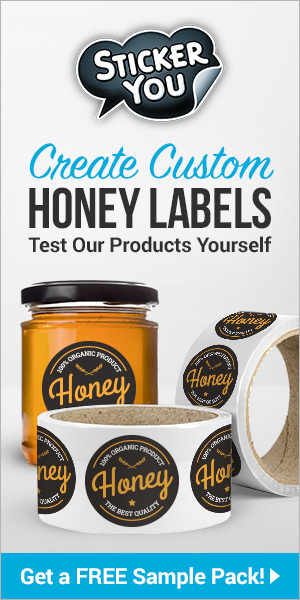 Honey bees will experience a myriad of pesticide products on crops, as individual applications, as well as tank mixes of a variety of chemical products. Those beekeepers pollinating individual crops may not see the pre-lethal effects until weeks after pollinating that crop. Beekeepers who remove their bees from a contracted crop pollination site, may discover in two weeks or a month the hives crashing, brood being pulled out, and or the queen has stopped laying. Whether the beekeeper has moved their bees to another crop to be pollinated, or they placed them on native ground to produce a honey crop, the bees are now showing pre-lethal signs of toxic exposure. Determining which toxin caused the current pre-lethal situation can be difficult and expensive. So how does a beekeeper report this type of bee loss? 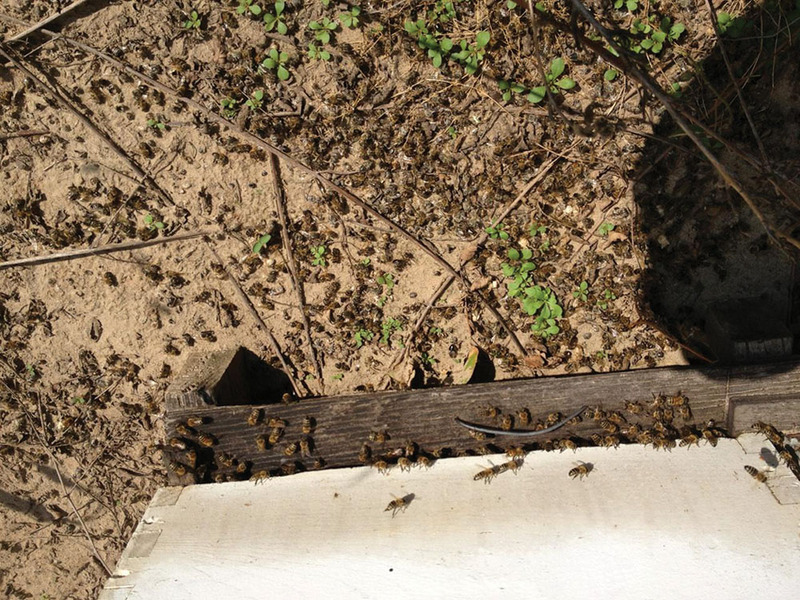 An acute bee kill is relatively easy to acknowledge and report: an inordinate amount of dead bees in front of the hive. Pre-lethal losses, such as a hive full of honey, but lacking honey bees; a reduction in adult foragers, and an imbalance of castes demanding bees take on a task before they are ready; a loss of a brood cycle, or two, a queen who stops laying are all difficult to evaluate as to the specific cause. These types of losses are not being tracked, not being counted, and yet these losses are prevalent in the real-world of our honey bees. Lab testing of pollen and other hive products is necessary to determine hive level concentrations. Concentrations that may not be at a lethal dose level, or even at a level of concentration, but the level is still causing damage to the organism that is a colony of honey bees. If we are to fully protect pollinators, funding needs to be available to support laboratory analysis of pollen and other hive products for not just pests and pathogens, but pesticide exposure as well. Beekeepers should not have to bear the full burden of the cost of lab tests on acute and pre-lethal bees and their hive products. To obtain this definitive analysis of the toxins in the hive, the toxins in the pollen and nectar collected by honey bees, scientific lab analysis is needed. 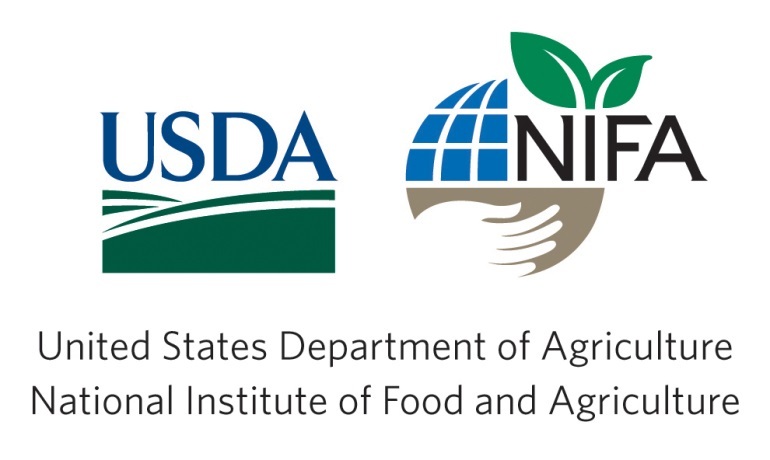 The lab analysis needs to be funded by those entities supporting agriculture and apiculture at the federal and state levels. EPA seeks the data of pesticides in the real-world. They collect data on bee kills, and prefer lab analysis to validate “anecdotal evidence.” Funding then needs to be provided to those entities who could assist with lab testing. Cost-sharing programs for lab testing have worked well with some University Extension Programs, but more programs need more funding. Research shows tank mixes of pesticides are more problematic than single use exposure of a pesticide. The real-world of our honey bees needs to have real-world testing. The EPA needs the data concerning actual pesticide exposure to honey bees to determine re-registrations, and/or adjustments to pesticide labels to protect human health and the environment. Lab testing of all hive products of a hive suffering inordinate losses would contribute to the research data sought by the EPA. As an indicator species, honey bees are an environmental beacon we should support by taking every opportunity to collect all the needed data in order to protect human health and the environment. We started the work in January 2014, and four out of five sample sets have been collected. We have made hive strength measurements and observations at regular intervals over the course of the year. The preliminary results are tantalizing. We now must finish analyzing the samples for pesticide residues and pathogen levels, and then do the statistical analysis. Visit the project page to find out more, and see how you can support this important work of the real-world of our honey bees. Our research on the hive tracking is a collaborative project involving our science partner PRI, the Flenniken Lab at Montana State University performing virus diagnostic testing of our samples, and commercial beekeepers pollinating a variety of crops. As government budgets are cut, the bulk of research of honey bees falls to university researchers, and non-profits. Valid research is research that is replicated and reviewed by others, and then validated by their research peers. Collaborative research such as our Hive Tracking Research project will be shared with the other research scientists and the beekeeping community. We must use these precious sources of funding wisely, funding projects that are collaborative, and most importantly peer-reviewed. Because all bee kill incident reporting currently is fixated on the presence (or lack thereof) of dead adult bees it is difficult to report bee kills which are sublethal to adult bees. This must change. All effects which diminish the health of pollinators must be acknowledged and addressed. The Pollinator Stewardship Council helps beekeepers through the reporting process. We encourage you to follow the ten steps to reporting a bee kill as defined in the May issue of Bee Culture magazine. Whether it is an acute bee kill, or a pre-lethal loss of your honey bees, the information about these losses is important. It is devastating to you as a beekeeper, but it is important information for EPA’s data collection and analysis. Even if lab analysis of hive products was not conducted, report these pre-lethal losses. The Pollinator Stewardship Council can help you report this data to the EPA. For more information about reporting bee losses visit our website or call us at 832-727-9492. CATCH THE BUZZ – Young Harris Beekeeping Institute Coming In May. Don’t Miss It! CATCH THE BUZZ – Sentinel Apiary Program – Find Out How You are Doing, and How Everybody Else is Doing. It’s The Wave of the Future. Sign Up Today!! CATCH THE BUZZ – Propolis Power-Up: How Beekeepers Can Encourage Resin Deposits for Better Hive Health.